Very Excited to be taking part for the first time in this once a year opportunity for visitors to buy unique gifts directly from the artists/makers and enjoy an alternative to high street Christmas shopping. The Venue – New England House is an eight story building located in Brighton England. Opened in 1963 it is the worlds first purpose built high rise industrial business centre. It is now the vibrant home to a variety of organisations from digital media companies to magazines, from a French bakery to life drawing and ceramics. The building is part of the brutalist architecture movement. 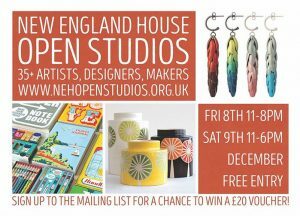 What to expect – This year, 30+ Artists’ and Makers’ on 4 floors will be selling to the public on THREE consecutive days. Beautiful handcrafted items will be on sale and with the opportunity to talk directly to the artists and makers.